When a person imagines a classroom, a more traditional visual may come to mind—students arranged in rows, quickly jotting down notes off slides that accompany a lecture. That standard method of teaching and learning has proved useful in academia. But, perhaps, a flipped perspective, a creatively reversed approach, would prove more successful for the generation and retention of new knowledge. 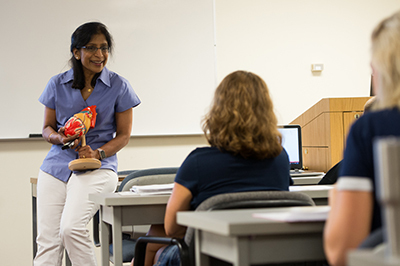 A study being conducted by Southern Illinois University Edwardsville’s Chaya Gopalan, PhD, associate professor in the Schools of Education, Health and Human Behavior, and Nursing, will compare and analyze traditional instruction and the flipped classroom. Gopalan is conducting research during the 2016-17 academic year through her position as a faculty fellow with the SIUE STEM (science, technology, engineering and mathematics) Center. Under the flipped classroom approach, lecture content is introduced outside the classroom, allowing more time during class to process the information and practice the content in a variety of active learning strategies, including teamwork and instant feedback. In the fall semester, Gopalan will use the traditional format to teach a biology course. In the spring, she will transition to the flipped classroom model for that same course. “My goal is to obtain specific details in transitioning from the lecture-type delivery of information to a learner-centered environment that supports active and engaged learning,” Gopalan said. The SIUE STEM Center’s faculty research fellowship program provides modest financial support for faculty, like Gopalan, who have ideas for novel ways to improve STEM education. It collaborates with the fellows to prepare proposals to external funding agencies for additional research and institutionalization of effective STEM education practices. Through her fellowship, Gopalan is eager to contribute to student retention and the enhancement of learning in STEM fields. 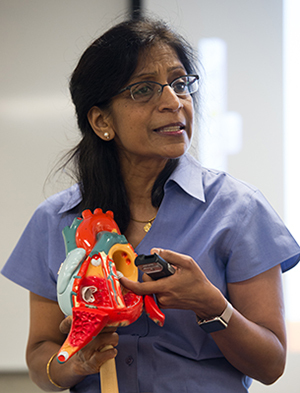 Photo: Dr. Chaya Gopalan, SIUE STEM Center faculty fellow, teaches a biology course at SIUE.